This post is oh so late but it’s ok! If you read my last post, you already know about why I’ve been so inactive. Harvey has taken a real toll on my city. But after days of clouds, darkness, rain and tears, the sun finally came out and Houston is just covered in sunshine! We still have so much recovery ahead of us and so many people are still in danger so at the end of this post I’ll be linking some ways you can help the people of Houston and other areas of Texas that have been affected by Hurricane Harvey. This is one of the posts I wrote when I was trying to relieve some stress a few days ago and I am just now getting a chance to publish it for y’all. This month’s box came with the usual booklet and drawstring cloth bag. This month’s booklet included some cute graphics of a periodic table made of different ingredients. Then, like usual, it included the information about the products page and my monthly 50 points for my VIB account at Sephora. I was so surprised to find this in my bag this month! Hourglass makes such high quality foundations and this formula was SOO creamy. However, I forgot to update my skin tone in my Sephora profile after marching band started and the foundation that came was way too light. I am probably just going to give it to my younger sister since it is the right shade for her. This mascara is so great! It is now one of my faves and the one I end up reaching for almost every single day. You prime your eyes with the white formula first, and then darken your lashes with the black. The white is very moisturizing and my lashes don’t end up feeling coarse or fallout from all the makeup. I LOVE THIS! So I have never used a serum before just because I don’t really have a need for one. However, this one smells really STRONG. It smells good, it is just really pungent. I’ll try this out, but it is definitely not something that I will use every day or frequently. This mist is really helpful with adding texture and volume to your hair while still keeping it soft. The few times I have used it, I have ended up liking the results! Y’ALL. OMG. I swear I just about screamed when I opened the bag and saw this mini beautyblender! This is so perfect for those little creases and corners on your face so I am soooo PUMPED! This fragrance smells really good! It smells like a mixture of jasmine, rose, and amber. It’s not something I would personally wear, but it is a really nice fragrance. That’s it for the Sephora PLAY! Box. I hope y’all enjoyed it! Now for the more serious stuff. Houston and the rest of Texas need your help. It is so utterly heartbreaking to see my city in this devastating state. People, friends and strangers, have lost so much. Whether you want to purchase something to raise money, donate money to organizations, or donate items, these are links to help you do so. There is ALWAYS something you can do if you are willing and able. Even $5 will help. Magnolia Market: Now through September 30th, Magnolia Market will be giving ALL proceeds from their Texas Forever shirt to the Hurricane Harvey Relief Efforts. I just bought two these for one of my sisters and I. It was such a great way to donate money and then get a sweet reminder of my home. Click HERE to purchase this shirt. Vineyard Vines: Vineyard Vines is taking 100% of the proceeds from their Texas Flag tees and donating it to the Hurricane Harvey Relief fund. Both the long sleeve and short sleeve tees go towards it. Both shirts are now sold out. However, if you really want one click HERE for short sleeve and HERE for the long sleeve. Then, sign up to be emailed when the shirts come back. Jack Rogers: Jack Rogers will be donating 50% of the proceeds from their Exclusive Texas Sandal to the American Red Cross Hurricane Harvey relief fund. 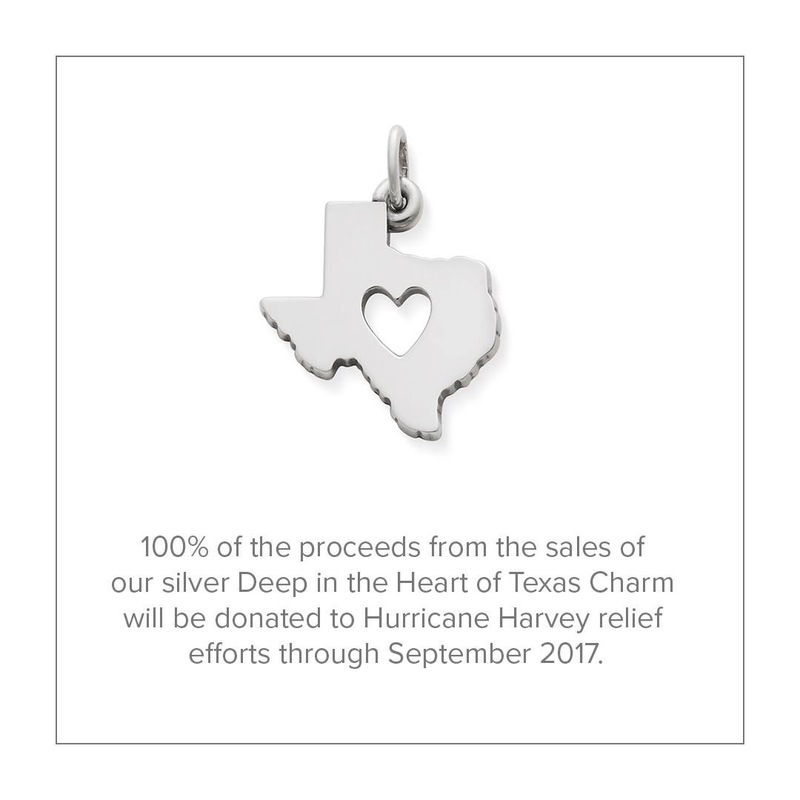 James Avery: James Avery is donating 100% of the proceeds from the sales of their Deep in the Heart of Texas Charm (silver) to the Hurricane Harvey Relief efforts through September of this year. Click HERE to purchase one of these charms. There are currently many ways to donate but two big ones are these organizations. *Hurricane Harvey Relief Fund: For information on how to donate money and items, click HERE. Then scroll down to the fund’s blue box. Red Cross Hurricane Harvey Fund: Click HERE to donate any amount of money to the Red Cross’s Hurricane Harvey fund. SPCA in Brazoria County: This animal shelter about an hour from Houston was hit with catastrophic flooding during Hurricane Harvey. Click HERE to go to their page, then hit the DONATE button to donate money to help these animals. Harris County Animal Shelter: This shelter requested items from their wish list. Click HERE to view their wish list. Then, buy and send the items to their shelter. Sugar and Cloth (one of my all time favorite blogs) in right here in Houston too and made a whole post about a TON of ways you can help including a drive this Thursday 8/31. She even set up a way to match people with families who are in need as a cause of the storm. Then, you can sponsor them and help them with supplies and other things. Click HERE to view her post and find out other ways to help. If you want to sponsor a family, scroll down to the sponsor section and fill out her form! Jadelynn Brooke: Jadelynn Brooke has launched project happy: operation backpack. Click HERE to buy a backpack for only $30 that is full of items that will go to an elementary school aged child in Texas for a fresh start. Each backpack will also come with a personalized card from you to let them know who gave them the backpack. So many children lost everything including their school supplies, so help them have something for when school start back up again! Jade, Brooke, and Lexi will deliver the backpacks to the elementary schools in need! I know this was quite a long post but for those of you who read it all, thank you. And if you donated, THANK YOU SO MUCH. If you are not sure if you can, please think about it. The best way to help people is through donating, and most of all, PRAYER. Pray for Houston and the rest of Texas and that we will recover from Harvey.